Spring has sprung. From one day to the next, the tulips were open, the ducklings were waddling around on our lawn and the cherry blossoms were in full blooming glory. Now a week later, the blossom petals dance through the air settling on all surfaces like sweet-smelling snow. My weekend has been filled with springtime music and garden party prep. On Sunday, rock‘n roller helped me carry out the heavy wooden garden table and benches, long enough to seat my eight girlfriends; interrupted by an afternoon phone call from great guy who was about to set sail. He’s on a week-long trip, at sailing school, off of the coast of one of Spain’s most beautiful islands, Mallorca. And, I’m, if truth be told, enjoying a week of solitude and quiet, amid party planning and work. Fun. 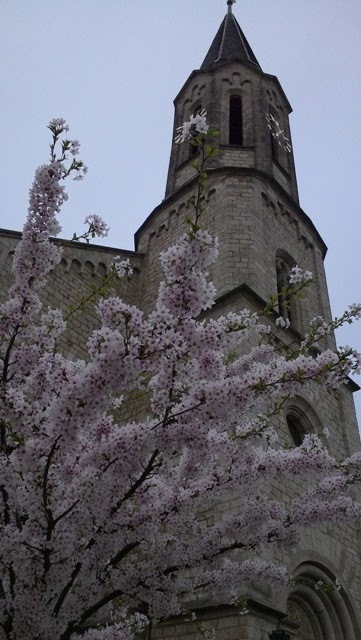 Sunday evening, after the church bells tolled five times, I found myself spontaneously attending a springtime concert in a, needless to say, old burg kirche (castle church). This church was built in 775 by Karl the Great and I was inspired sitting in a building with such history. The four voices echoed beautifully throughout the tall, narrow altar; looked down upon by the original stained glass window (the Marienfenster) from 1404, surprisingly still standing the test of time. The peppy tunes varied from the 1400’s to the 1900’s; from flirty, romantic love songs to heartbreaking songs of home, like the ‘Oak and the Ash’. And, all the while I heard birds chirping along outside with great enthusiasm – made me smile. 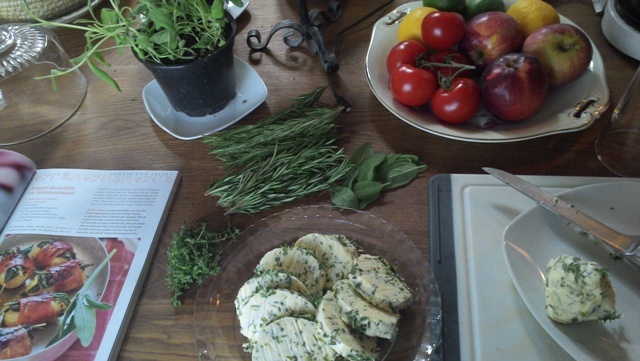 Tuesday evening, I was in herb fever. My friends slowly started to arrive as the evening sky was still full of light and full of blue. We sat at the one long table, happy to finally be sitting outside by the river. The table was full; mason jars lit with chunky candles; platters and plates filled with rosemary meatballs; baked new potatoes wrapped snuggly in parma schinken, twiggy thyme and leafy sage; parsley mint couscous salad; and small bundles of phyllo pastry filled with either spinach and feta or smoked north sea salmon. 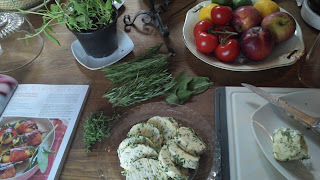 Potted jars of mint yogurt and herb quark joined the lemon chive butter which I had set earlier in the afternoon. It made me happy seeing how joyfully my super-slim mädels (like they mostly all are here) ripped baguette, slathered butter and just dug in with gusto. And, the biggest surprise was how easy it was to prepare. Really, truly. Just add herbs. Try it. Yum. Let the bun soak in warm water. Saute the onion in oil and then stand to cool. Sqeeze the water out of the bun and add it, along with the onion and egg, to the ground beef. Add the mustard and herbs, salt and pepper. Form balls and in a heated frying pan cook the meatballs for approx. 8 minutes until they are golden brown and completely cooked through. Let them stand to cool. Add the chopped mint leaves, minced garlic and a pinch of salt to the yogurt. Stir in pepper and lemon juice to taste. Wash and pat to dry the sage and rosemary. Then skewer the meatballs alternating each one with a sage leaf. 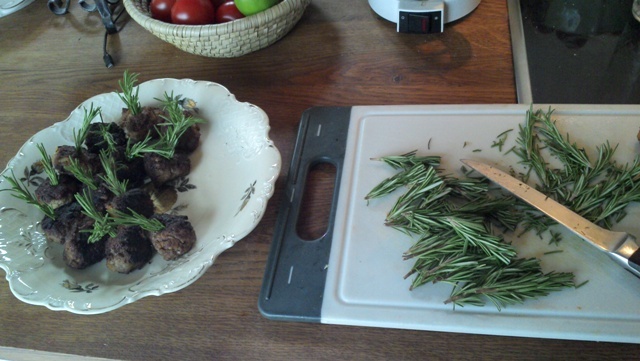 Or, take a small rosemary twig and stick one in each meatball. Serve with dip. Spring is here. And, the low whistling of swans’ wings keeps me company. It surprises me as I walk through the narrow gasse (lane) of the altstadt or as I water my poppies; opened wide as if singing in a choir. The long, thin shadows, all of a sudden appear overhead…the whistling makes me look up. I love that whistling. And the fields and the gardens are pleasant and gay.